Two sites located within a junction, connected by a one mile public road. Modern Roadchef services at the M1/A43 junction, although it has been designed so that you can enter and leave the services without passing through the main junction. First two hours free for all vehicles, after which cars must pay £20 and HGVs, caravans and coaches £27, or £29 to include a £10 food voucher. Prices are paid using PayByPhone - more details or in the shop or restaurant. The location code is 5250 (northbound) and 5251 (southbound). An old Blue Boar forecourt. It was called Rothersthorpe until Roadchef took it over from Blue Boar. They replaced the building as part of a significant investment, and gave it a new name to boot. The northbound side was used to trial Spar. It opened on 30 September 2015 and was later introduced to more services. The filling station is operated by BP Express. The southbound Costa Drive Thru opened on 25 August 2017. Rothersthorpe was one of five small services first zoned. It served as only a northbound maintenance compound until it was decided the adjacent Watford Gap was too full. As both Rothersthorpe and Watford Gap were so small, an exception was made to the rule which would have prevented Blue Boar from running both. When tendering for a new operator, an emphasis was placed on it being a difficult site requiring experience to run it. The replaced footbridge no longer leads anywhere. 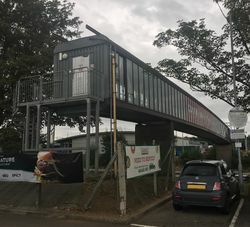 A footbridge between the two sides of the services needed to be built at the same time as the motorway, although it was rushed and never formally approved. 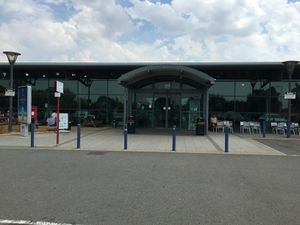 This and the large maintenance compound left little room to design and landscape the services, causing it to look tired from the moment it eventually opened. Eventually two very small buildings (southbound being the larger of the two) were built next to the footbridge, designed mainly for commercial traffic. They were described as "austere" and "stark", and faced a number of planning difficulties. Each one was a short rectangle with a tall roof that doubled-up as a canopy. The footbridge was replaced in 1980. There was also a plan to build a motel here but it was refused. After Roadchef took over, in 2001 they replaced each building with a more modern design and disconnected the footbridge. In 1986, Which? said the restaurant was "small but cheerful", and that the services were "drab but clean". Originally, there would have been a rear access on to Banbury Lane to the west, and then later the new A43 to the east. 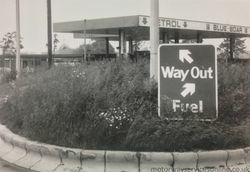 In 1983, plans were drawn up to improve the A43, with the new road opening in 1988. A simple junction was built which was wrapped around the services, which then grew to fill the space available. Despite the new junction, the services retained their original online design, meaning visitors can, if they like, choose which facility they visit. The below feedback has been provided by visitors of Motorway Services Online for public viewing. Roadchef have an official review form, with prize draw.